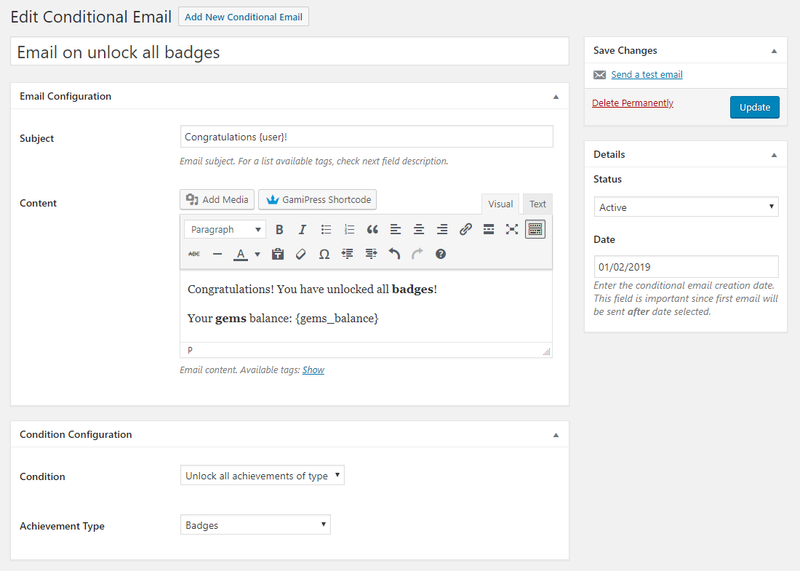 You will find the Conditional Emails screen on your WordPress admin area navigating to the GamiPress menu -> Conditional Emails submenu. 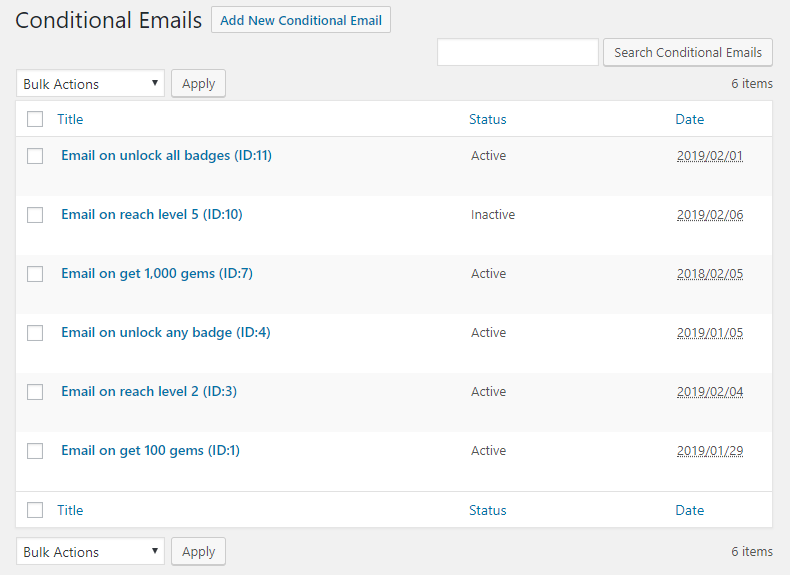 The conditional emails screen is a quick view of all conditional emails stored by GamiPress – Conditional Emails. Quickly you will see each conditional email title, status and date. Clicking on the Edit link, you will be redirected to the conditional email edit screen. Through the Email Configuration box you can setup the email subject and content that will be sent to your users. There is a list of all available tags. Through the Condition Configuration box you can setup the event that will process this conditional email. Available conditons: Reach a points balance, Unlock a specific achievement, Unlock any achievement of type, Unlock all achievements of type and Reach a specific rank. In addition, a new set of fields will appear based on the condition you set in order to fully configure it, for example, if you choose the condition Reach a points balance you will see a new set of fields that will let you setup the points amount and the points type. Through the Details box you can setup some of the important fields of the conditional email that make it available to being sent. The conditional email’s status (active or inactive). Note: Just conditional email with status active will be sent. The conditional email’s creation date. Note: This field is important since first email will be sent after date selected. From the Save Changes box you will be able to perform some extra actions related to the conditional email. The send a test email action will send a email to your account’s email to let you check how the conditional email will look to your users. Remember to save the changes to reflect them on the test email.